Even in this age of technology, experiences that touch upon all five senses pack a punch. 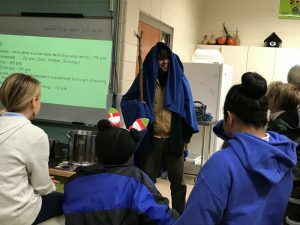 Whether that be putting out Austrian winter pea as a cover crop or receiving a weary stranger into the classroom to share stone soup, people to people or people to nature experiences are incapable of being matched for their impact. A couple of years ago, after our first soil conservation day with Clarke Middle School 6th grade science classes, a student was having a difficult time remembering soil conservation practices. The teacher referred him to the field trip to the school garden. It was then that the student took her through each stop in the field trip covering three different soil conservation practices. Then, on a test question about soil conservation, the three most commonly sighted soil conservation practices were those the students had learned about in their school garden. Could we teach every class in the school garden? No. Could we teach every class using the school garden in some fashion or another. We believe so. Algebra and Geometry. Check. Social Studies and Georgia history. Double check. Art and Biology. Triple check. And we believe the experiential component of a school garden together with its pertinence to food systems, natural resources, and sustainability is unbeatable in providing educational experiences. Last week I knocked on the door of Dr. Mitchell’s agriculture science class. My shoes off and feet smeared with red clay, I held a wooden staff and had a blue table cloth over my head and wrapped around me. Weary Traveler was my role. Dr. Mitchell and her students had made stone soup from the veggies in their garden the day before. I portrayed the weary traveler with a stone in my pocket in need of food. The kids played along, letting me in and allowing me to tell them the stone soup story, i.e. DIY guide to building community and feeding yourself using only a stone! That night at the Athens Downtown Parade of Lights, a student recognized me. “Hey Gardener Wick!” She is in eighth grade and knew me from after-school garden and cooking classes. Her brother, a sixth grader at CMS, asked, “Are you the weary traveler guy who came to my classroom today?” I was wearing essentially the same clothing, minus the table cloth, plus the shoes. He then went on to his parents about how great the stone soup had been, detailing the produce they had picked, sliced and cooked from the school garden, collard greens, kale, carrots, parsley, and beets! That experience seeded a memory in him that might one day feed his family or inspire him to study horticulture or move him to be a farmer. That is a school garden. Posted in Food Systems, School Gardens, Student Minds, Uncategorized. Bookmark the permalink.